, an ancient Latin author, who wrote five books of “Fables” in Iambic verse, was a Thracian and was born, as there is reason to suppose, some years before Julius Caesar made himself master of the Roman empire. His parentage is uncertain; though some have imagined his liberal education to be an argument that it was not mean. Perhaps he might have been made captive by Octavius, the father of the emperor Augustus; for we read, that while Octavius was prcetor in Macedonia, he gave the | Thracians a very great overthrow. This fell out the same year that Q. Cicero was proconsul of Asia, and Csesar sole consul at Rome. As this opinion would carry his age pretty high, Phsedrus outliving the 18th year of Tiberius, pome have therefore rejected it, though with little reason; since many proofs may be collected, from his Fables, that he lived to be very old. 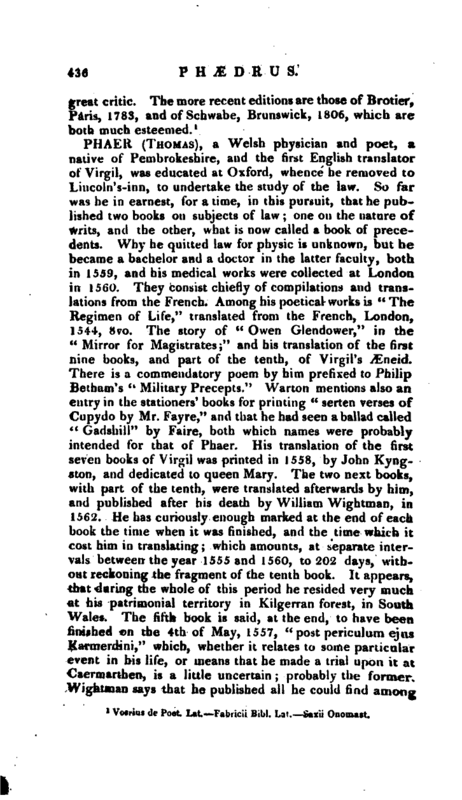 How he came into the service of Augustus is unknown: but his being called “Augustus’s freedman,” in the title of his book, shews that he had been that emperor’s slave. It should seem as if he had arrived early in life at Rome for he quotes a line from “Ennius,” which, he says, he remembers to have read when he was a boy and it is not probable that he should have read it before he left Thrace. He received his freedom from Augustus, and no doubt such a competency, as enabled him to enjoy that valuable gift. He expresses a great regard for that prince’s memory, which he had indeed the more reason to do, since misfortunes overtook him after his decease. Under Tiberius, he was unjustly persecuted by Sejanus, to which he has frequently alluded in his “Fables;” and particularly in the preface to his third book. We know not the cause of this persecution, but it was not for his wealth: he represents himself, in the very same place, as a man who had never cared to hoard up riches; and mentions this as one of the reasons which should facilitate his promotion to the rank of a poet. 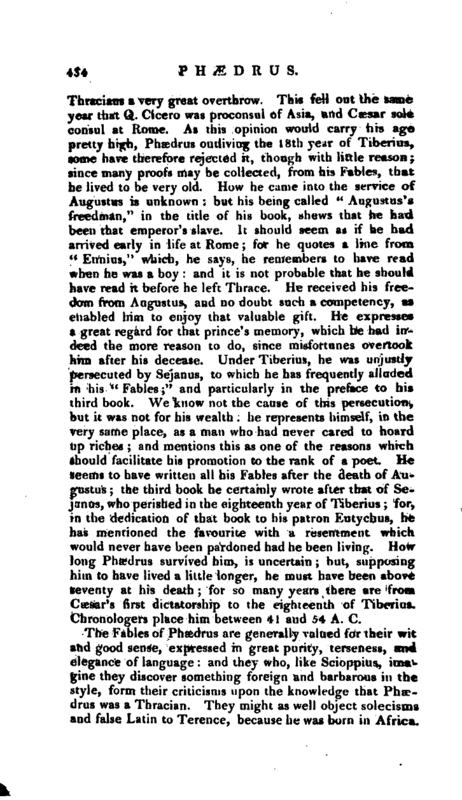 He seems to have written all his Fables after the death of Augustus; the third book he certainly wrote after that of Sejanus, who perished in the eighteenth year of Tiberius; for, in the dedication of that book to his patron Eutychus, he has mentioned the favourite with a resentment which would never have been pardoned had he been living. How long Phsedrus survived him, is uncertain; but, supposing him to have lived a little longer, he must have been above seventy at his death; for so many years there are from Caesar’s first dictatorship to the eighteenth of Tiberius. Chronologers place him between 41 and 54 A. C.
The Fables of Phaedrus are generally valued for their wit and good sense, expressed in great purity, terseness, and elegance of language: and they who, like Scioppius, imagine they discover something foreign and barbarous in the style, form their criticisms upon the knowledge that JMuvdrus was a Thracian. They might as well object solecisms and false Latin to Terence, because he x wus born in Africa. | We cannot, however, but observe it as somewhat singular, that the Roman language has been transmitted to posterity, in its greatest purity 'and elegance, by two slaves, who were brought from countries by the Romans deemed barbarous. It is remarkable, that no writer of antiquity has made any mention of this author; for it is generally supposed, that the Phcedrus mentioned by Martial is not the same. 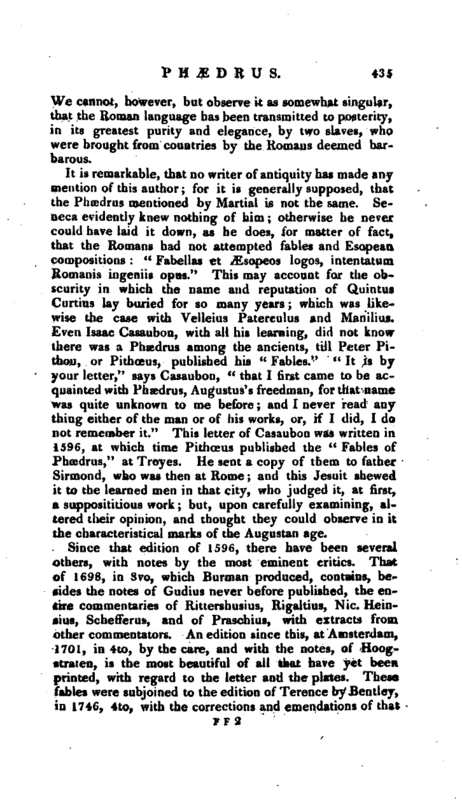 Seneca evidently knew nothing of him; otherwise he never could have laid it down, as he does, for matter of fact, that the Romans had not attempted fables and Esopean compositions: “Fabellas et ^sopeos logos, intentatum Romanis ingeniis opus.” This may account for the obscurity in which the name and reputation of Quintus Curtius lay buried for so many years; which was likewise the case with Velleius Paterculus and Manilius. 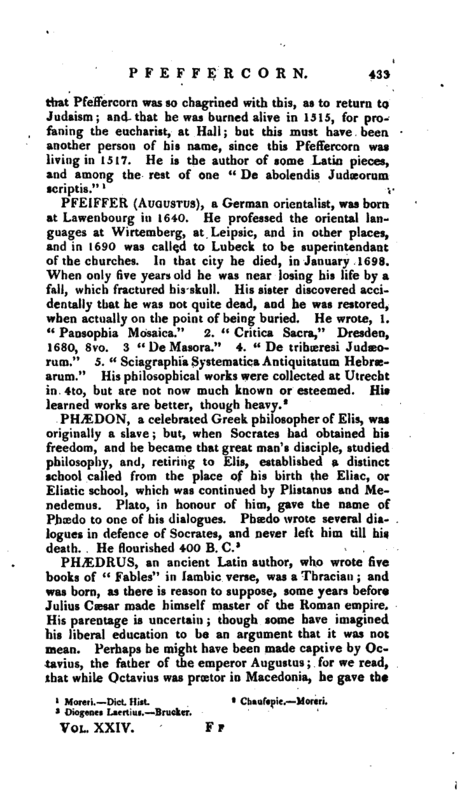 Even Isaac Casaubon, with all his learning, did not know there was a Phaedrus among the ancients, till Peter Pithou, or Pithceus, published his “Fables.” c It is by your letter,“says Casaubon,” that I first came to be acquainted with Phaedrus, Augustus’s freedman, for that name was quite unknown to me before; and I never read any thing either of the man or of his works, or, if I did, I do not remember it.“This letter of Casaubon was written in 1596, at which time Pithceus published the” Fables of Phoedrus," at Troyes. He sent a copy of them to father Sirmond, who was then at Rome; and this Jesuit shewed it to the learned men in that city, who judged it, at first, a supposititious work; but, upon carefully examining, altered their opinion, and thought they could observe in it the characteristical marks of the Augustan age. 1 Vossius de Port. Lat. Fakricii Bibl. Lat. —Saxii Onomast.